She knows. She definitely knows. I'm not sure how she knows. I'm not stupid enough to keep a diary, and I'm not one of those weirdos who's all Mum's-my-best-friend-and-we-tell-each-other-everything. Perhaps it's some kind of sixth sense, unique to mothers? In my house everything stops for a Cat Clarke book. She is one of my favourite YA authors, because she isn't afraid to tackle difficult subjects in her prose. The Lost and The Found follows brightly on from it's predecessors, giving the readers a beautifully written, yet page turningly addictive, unputdownable novel. This book deals with a rather topical and sensitive subject - child abduction. Little Laurel was taken from outside her house when she was only six, only to be returned thirteen years later. You would think a story like this would be told from the point of view of Laurel, but it isn't. No, Cat Clarke turns it on its head, telling the story from the perspective of her younger sister, Faith, who lived with the disappearance of her sister and is learning to come to terms with her return. No one ever looks at how the family will change when a loved one is returned, but undoubtedly it does, as the absence has been such a great void in their lives. I found it fascinating to watch Faith's relationship change with her sister as the story progresses. How she changed her feelings towards her as her own life felt invaded. The dynamics of Laurel's fractured family played a big part of the story. With her parents no longer together and her Dad now in another relationship, the family found it difficult to reunite for Laurel's return. It shows how hard it is to fix what has previously been broken. Michel, Dad's boyfriend, is one of my favourite characters in the book, as he doesn't try to be a parent to either girls, he just wants to be a friend to them, someone who they can go to, when they don't feel they can approach their parents. What more could you ask for from a step parent? There are elements of surprise within the plot, which I had an inkling about, but luckily it didn't change my feelings towards any of the characters. All it shows is the wide spectrum of human nature. At the heart of the story, there is a mystery. What happened to Laurel while she was gone? That is the question on everyone's lips and it isn't until the end that you find out the truth. 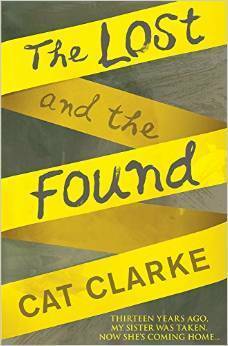 If you haven't read a Cat Clarke novel, you really are missing out on a great UKYA author.